I would like maybe four kids total…I cannot imagine having 7, 8 or more. My husband and I are just not cut out for that. My initial reaction to statements like that is always, “Whoa! Does that mean there are people who actually think they are cut out for that?” In my life I’ve known one or two couples who, early in marriage, thought that they had what it takes to have five or six kids…and then had a drastic change of mind, usually around the time when the second baby started teething. It is from this background that I can proclaim with great joy that God does indeed equip the called. If three years ago I had had all the facts about what motherhood really entails and sat down to carefully analyze whether or not this is an endeavor I should undertake, the overwhelming verdict would have been to get a goldfish and call it a day. What I couldn’t have known in my pre-kid days, though, is how much God was planning to use motherhood to transform me. 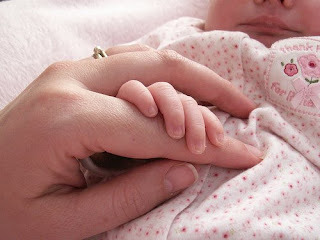 I would never have guessed that the experience of holding my first newborn baby would be one of the final blows to my life of atheism; I could not have known that the difficulty of managing a strong-willed toddler and a very loud redheaded baby with a redheaded temperament would push me to a level of depending on God that I would have never sought on my own; never in my dreams would I have thought that an unexpected, untimely, potentially financially ruinous pregnancy would bring with it a series of experiences and answered prayers so profound that I’d never be the same again. And, of course, I cannot imagine what God is planning for these three little souls I’ve helped bring into the world. I can be certain, however, that the world is a better place for them being here. When I think of my life as a mother and the future of our family, I’m reminded of that great poem They Weren’t Ready. I now see the decision-making process for how many children I should have solely as an issue of accurately discerning God’s will, rather than approaching it from the perspective of what I think I can do. I assume that God knows my limits and he’ll take into account my weaknesses in his plan for the number of children I should attempt to parent. And who knows, perhaps after this next baby gets here God will clearly reveal his will to be something like, “Quit having kids! Now! Just try to keep the ones you have alive!” I think, however, that I am called to have a fairly large number of children. And it’s hard not to second-guess that call. I often think that I just don’t have what it takes. But then again, who does? What sane woman who currently has few or no children could confidently say, “I could definitely handle six, seven, eight kids — no sweat!” I think that almost nobody could do it on her own, without God’s grace. Of course not every family is called to have lots of children — I don’t mean to imply that every couple who decides that a small family is best for them isn’t following God’s will. I only offer my experience as a testament to the fact that when making decisions about bringing new lives into the world, we should focus a lot more on accurately discerning God’s will and a lot less on our own assessment of what we think we can and can’t do. As I have found, God sometimes calls people to do very unlikely, seemingly impossible things — especially when it comes to parenthood. But he does, indeed, equip the called. « "The finger of God is here"
Never in my wildest imaginings did I see myself having 5 kids (well, 4 already here and one in progress). I still kind of can’t believe I am that person. But, I know that I have been stretched and challenged and humbled more as a parent than anything else I have done. Parenting a large family is my path to holiness. At least I hope it is. I actually disliked children very much before having my own… I had the same type of childhood as yours, not doing chores, etc. I find it hard to keep the house up to my husband’s standards, and it is one of the reasons he doesn’t want more. My husband and I, when we got married, decided that a family of 6 kids was about right for us. We had 6 children and 4 miscarriages, and now, one grandchild. Jen, you say this so beautifully, and you echo so many of the thoughts I have, especially the part about God getting you there with motherhood – and how motherhood would be the tool God used to transform you. *clapping* Well said! Like most people (I think) my past is riddled with mistakes and foolishness. There are many things I would change if I could, but the only thing I really regret is that I had only five children (and a miscarriage). Grandmotherhood is a joy, but motherhood allows you to work directly with the Creator – what could be more sacred? Wow, Jen… that was an amazing, beautiful post! And every word you said was so true. If ANYONE had looked at me in my pre-kid days, they would NOT have thought I’d make a good mom to 7. No way. I am selfish, impatient (big time! ), and a neat freak (oh, that works well with a large family! ha). I *HATED* babysitting when I was a teenager. Three, He gives us all the grace we need. I NEVER feel ready, and I always panic giving birth to the next child (“How am I going to handle #whatever? I can’t do this!! !”) As soon as that baby comes, however, His grace and strength is there, and off we go! So beautifully said!!!!! I was one of those who never wanted children. Maybe one at 40. But when my first was born, I was so blown away. I came to God, too, because of my children. Just the other day my dad was laughing and reminding me how everyone we know is SHOCKED that I’m a mother of four, and loving every minute of it. Yofed, I’m there too. What do you do when hubby says, “No more babies!”? Wow. Are you my long-lost twin or something? 🙂 That describes me and my life to a T. Your childhood sounded sort of like mine, also. I’m a cradle Catholic but I never had many chores, had only one sibling who is two years younger than me, and only baby-sat a couple times. I honestly didn’t think any mother of a large family (or any mother who thought she was called to have a large family some day) felt that way. I’m still not sure what to do if you and your husband aren’t quite on the same page, though. My husband is even more scared than I am of a large family. I guess just pray? I think it’s very unusual in American culture to NOT have a number of children in mind. That goes for all those doing in-vitro, etc, too. They have decided that they WILL have a child, no matter if God says otherwise. Like some other commenters, my husband has a set number in mind. He is not Catholic, and wants to get himself sterilized after a certain age/number of children. It’s very painful for me to think about. I guess what I want to know is- what makes him think he KNOWS that he won’t want to accept another child(ren)at some point? What if God places the desire for another child into his heart after he’s already taken drastic measures to prevent having another? I’d like to stay open to that possibility, but I know it’s hard for my husband when he is just.so.tired right now with all the little ones and being the sole provider. That is SOOO me!! Haha! Jen, I actually just took a pregnancy test because I have been such a CRAB this week. It was negative. I was relieved, but still a little sad. I’m one of those women who always wanted a lot of kids. As soon as two are born, I want two more! ;) My best friends were from a family of 8, while I was from the sad, clean, little family of four;). My house is currently a wreck, even though my mom is here helping out for the week! But, every kid is cuddled, fed, and prayed over. If I can get through the day without yelling, I feel pretty successful. Maybe I will never be a “supermom”, whatever that means; but, I’m willing to keep learning. Does that make me “called”? Hmmm.. I may have a lot of people to convince when the test does come back “positive”, but I think so. Anyway, beautiful post! Thanks for writing it! I think, however, that I am called to have a fairly large number of children. I likely am, too. I just haven’t come to the point where I’m O.K. with that. And it is difficult to know when you’re answering God’s call vs. just not practicing NFP in an accurate or responsible way, or whatever. I believe that every child is a gift, but sometimes that’s a difficult reality to live up to day-by-day, meaning that I love the ones I have, I worry about their welfare, and I stress about the one(s) to come alternately, with the stress taking precedence 9 out of 10 moments of the day. And of course, my other question is why the gift of fertility/co-creation seems to take precedence over the other God-given gifts we possess in discussions like this. I have a hard time thinking that it was God’s will that I pursue the Ph.D. in order NOT to get the job I have been working towards. So do I conclude that I chose the wrong path and have been working futilely all these years? I can’t see that. Anyway, I can’t raise these 3, 4, 8 kids or whatever with two sets of student loans and no tenure-track job, and without the educations we’ve gotten, we’d still be wallowing in poverty in New Orleans–worse than ever, after Katrina… It really strikes me that we can’t see the big picture until after the fact, but where does that leave us? Prayerfully discerning. I guess in my case being called and being suitably equipped to the calling means finding the way to balance all of these things. Incidently, I DID the chores when I was a child–in fact, I did MOST of the chores. I was the oldest of 6, so I DID know all about kids, etc. It doesn’t mean I want to do all of my own laundry now, in fact, it’s more like “It’s my house now, I don’t HAVE to fold the clothes!” But juggling siblings and housework (especially in a dysfunctional family situation) just makes me more apprehensive of the challenges of a large family–financial, emotional, etc. But I guess if I can have a successful marriage after my upbringing, I can manage a successful family, too. This just carries a lot of baggage for me. Sorry for rambling. It is nice to hear a mother of 7 say this! Thanks, Ouiz! Not sure if it would work for everybody. And of course, my other question is why the gift of fertility/co-creation seems to take precedence over the other God-given gifts we possess in discussions like this. I have a hard time thinking that it was God’s will that I pursue the Ph.D. in order NOT to get the job I have been working towards. This is something I’ve struggled with as well. Check out the first comment to this post I wrote a while back on a very similar subject. I’d be interested to see what you think. That comment led to a turning point for me in evaluating my life and my plans for the future. This applies to all women. There are couples that have larger families than they had planned or thought they could handle. And there are couples that would have loved a house full of children but were only able to have one. What I couldn’t have known in my pre-kid days, though, is how much God was planning to use motherhood to transform me. I was just talking to Honey about this the other night. We both agree that since I became a mother I have changed. It is difficult for me to be a part of the corporate world. I feel a need to do something more with my gifts and talents. I think every woman should be warned that Motherhood WILL change you. I struggle with “the number” a lot. Especially lately – I have been SO sick with this pregnancy that I just cannot see how I can do it again. I just don’t know if it would even be fair to my family to do it again. I will continue to be open to life knowing that if I am blessed again the Lord will give me the graces necessary to make it through whatever type of pregnancy He gives me but…at this point, I can honestly say I feel completely at peace with the thought that my family will be whole once this baby is born. I just don’t feel that anyone is missing from our family like I have during past pregnancies. So I guess I’ll just need to discern if that is my wishful thinking or peace from the Lord! I’m a friend of 4andcounting. Great post. It’s something that’s been on my mind as well. I read this last night and the one thing that I’m still thinking about is part of the title – God equips the called. So true. I need to really remember that. You know, the timing of this post is interesting because I was recently remembering an early post of Jen’s from her old blog about how she started on this spiritual quest away from atheism because of her first child. And other comments that she had considered not having any children made me wonder – what made her decide to have that first child? Also, no one on this thread has mentioned adoption. What are the thoughts on God calling families to grow through adoption rather than pregnancy? My (completely amateur) thoughts are that this would be a stronger option for those with a history of difficult pregnancies, or pregnancies with medical complications. I just received the “new mom” packet at my OB’s office on Monday and it included one of those baby magazines. One of the articles was about determining what number of children is right for you. Anyway, I’m so glad there’s at least one corner of my world where I can retreat and find like-minded people. Thanks. I read the post and the comment, but my thoughts don’t fit here or there. If you’d like to drop me an email, I would be happy to give my thoughts! And other comments that she had considered not having any children made me wonder – what made her decide to have that first child? No one on this thread has mentioned adoption. What are the thoughts on God calling families to grow through adoption rather than pregnancy? This is another great point, and actually something I thought about after I wrote that post. I’ve always thrown out statements like, “I could never adopt, I don’t have what it takes”…but then I realized that I’m not at all being open to God’s will when I make statements like that. Perhaps God *will* call me to adopt and provide me with the skills I need. I read the blogs of quite a few Catholic/Christian moms who feel that they are called to adopt. Some have biological children, some don’t, but God definitely calls people to parenthood through that path as well. A beautifully written and inspiring post! Something to which I have given much thought, but could never articulate. You said it perfectly. I’m a mom of seven–three came to us by birth, 4 via adoption. I never dreamed this big, but God knew what we needed and what our kids needed too. Our family is forever changed/blessed with each addition to our family. I could have written this! Though not as eloquently, mind you. It appears from the 27 comments before mine that I am not alone. Thank you for sharing. It’s always nice to see that there are others walking this uncharted path with me. Thanks for the well written entry. hmm. you are an inspiration when it comes to motherhood. I L O V E T H I S P O S T!!!!! Beatifully written! I had tears in my eyes! We have 6 children so far….my youngest is 3 months old. Thank you for this! I want put a link on my blog to this but I don’t know how to do it!!! ARGGHHH! (I’m still kinda new at the whole blog thing). I have known in my gut for years what my calling was in terms of motherhood. When I started to second guess it, I was amazingly redirected by “chance.” My husband has been long in coming to the program but now that he has arrived, I feel we are on the same page. There’s no number in mind. There’s just a very strong sense of openness and readiness. All the preconceived notions of what was “right” for us have kind of fallen to the wayside. We are operating purely on instinct at this point. On a side note, my sister had an imaginary number set and never shared it with her husband. After she reached her “goal” the deed was done. After a couple of years, my BIL mentioned (having had 1 too many beers and being outside – away from my sister’s prying ears) that he felt betrayed by her determination to stick with this “number.” In his heart, he wasn’t done parenting and wanted to be a father again. This message has stuck to me. I carried it around for a long time. It came to me when I needed to hear it most. It became important that my husband and start and end our journey in a different place than my sister and BIL. We have succeeded. Oh. Her magic number? It was 1. I could have written the fifth paragraph of this post. Wow. My husband and I have seven children (I am 40, he 41, and I do the “how many years of fertility left?” too). Though we are both serious Catholics now, we married when I was a pathetic Catholic and he was an agnostic Jew. We intended to have two or three children (though I always thought more would be great, but that just wasn’t done by educated, civilized folk!). We both came from families of two children, so this “big family” thing is new to us! I feel like I am not worthy to parent seven children, yet they are blessings beyond measure. I struggle with the thought of having more, since I am so crabby and tired. But the thought of NOT bringing another beautiful child into this world is hard to think about. I have no idea where God will take us on this issue, and I hope my husband and I will listen well to His promptings. Right now, our baby just turned one, and our oldest is a junior in high school. Five of our children are boys, and frankly, they wear me out! Knowing I only have a few years of fertility left is heartbreaking on one level, and a relief on another. If I could grow in holiness, I would be ready for more, though. Hmmmmm, maybe that’s my answer? You ladies are all great, and I’ve loved reading your comments!! I’m just getting around to this post, having been directed to your blog tonight, and already having spent about 2 hours (that I don’t have to spare!)reading! I am the adoptive mother of two. God brought them to us within 6 mos. of each other (arrival) and 4.5 mos. of each other (age). The second one was unexpected — to say the least. I now say — Only God could make twins out of two children born 8000 miles apart from each other! We tried for 6 years to conceive before approaching adoption. There is nothing medically “wrong” with either of us — just God’s plan. We had been open to adoption from our newlywed years, thinking of it as a way to expand our family, not thinking of it as a way to start our family. We’re both 43, now with two 4 yr.olds. Nope, this wasn’t the way we planned it, but my Lord it is wondrous! I would “have” more (and more, and more) on some days. On other days I wonder what God was thinking when He “did” this to me! Nonetheless, I know that if another baby was dropped in our laps (like our son was), we’d be thrilled. I do wonder why God sets desires like these so strongly in our hearts, and then they are not always fulfilled. I’m from a family of 4 children, so 2 seems to little to me. But I trust that the Lord knows what He’s doing, and that I can’t always see the whole picture. I asked God for patience, and he said wait.. I am amazed by the number of people who think that the patient parents of large broods just started out that way. We all grow into it. One of the ways in which children are blessings is by the way in which we have to grow in order to parent them. I’m voraciously reading your past blogs and this one really hit home with me, especially when you wrote, “When making decisions about bringing new lives into the world, we should focus a lot more on accurately discerning God’s will and a lot less on our own assessment of what we think we can and can’t do.” I’m constantly wondering if I’m cut out to have a big family. Actually, I’m often wondering if I can have another kiddo. I’m so wishy-washy. I have a good day in the mommy trenches and I’m saying, “Bring it on, God! Give me 12 kids. I can handle it.” Then I have a breakdown over the fact that my preschooler refuses to poop even though she’s doing the telltale “poop dance,” which means only one thing: she has to poop, and I think, “I can’t take this. I am not cut out to be a mom.” But God, in his infinite wisdom, knows the “perfect” number for my husband and me. I’ve just got to trust him. Great post. You go, girl – if I can raise 6 kids, anyone can. Just to let you know, I am a single 21 year old cradle Catholic, who has recently grown and had a “reversion” back to my faith. I always was Catholic, but now I LOVE being Catholic. I’ve struggle with if I am called to be a mother, because basically I’m domestically challenged, and I’m scared to have kids. I don’t love babysitting, but God keeps making me. Haha, moms call me a lot even though I hate it! I always wanted to be one of those girls who was like, “ooh i wanna have 8 kids.” Frankly, that scares me. So reading your post was so refreshing. This thought actually flutters into my head a lot, God wants me to depend on Him COMPLETELY, and i know with my calling to motherhood, I am gonna need Him ALL THE TIME. I can’t even hold newborns right…they always cry because they know I’m unsure of myself. I’m living out in the Czech Republic right now studying abroad (69% atheist) so I’m really interested in reading your story. Hopefully I can draw others to the faith out here 🙂 Thank you for your post btw. Haha, my fav part: Cool, I swept the floor. That’s so me. What a fantastic post!! I wallow a bit in my self pity parties, since I feel I was ill equipped to handle a large family as well. Didn’t have a good role model, was a self-professed ‘career woman’, am impatient and self centered at times …. the list goes on and on. I do agree with you,that motherhood transforms you in ways that are unfathomable, until you are in the midst of raising your children. God bless you, and all of the rest of us who are working on our equipment! I’ve just read several of your posts, and they are really excellent, this one especially! I’m “only” pregnant with number four right now, but I’m already starting to hear comments like, “You must be really patient.” (HA!) “I could never do that.” (Sure you could.) “How do you even have time to make dinner?” (Well…) I think your title for this post is the perfect response. And it’s the perfect reminder for me on the rough days when I’m not patient, don’t feel like I can do it, and don’t manage to have dinner ready when my beloved husband walks in the door. This job may be bigger than I am, but it sure isn’t bigger than God! Thanks for the wonderful encouragement. Do you mind if I link to this post? I surfed on over from Pursuing Titus 2. What a beautiful post! You've articulated so well the lesson that hit me about 2-1/2 years ago when I had a 4-month old and a new 2-year old… and I appreciate and reminder… and am incredibly encouraged to hear the similarities between our housekeeping styles. Thanks! When praying about the number of children God might be calling you to, please don't forget the great many children waiting to be adopted into families! Adoption has been on my heart for many years and I've always wondered how God would bring it to fruition… because I didn't feel called to forego pregnancy in favor of exclusively adopting. But lo and behold – with a little waiting on Him and a faith-building roller-coaster motivating me to trust Him well beyond my own understanding, here we are with one daughter in heaven, two busy ones in our household, and now beginning the process to welcome some older children through the fost/adopt system. If you or your husband have been previously sterilized… you can still bless a child with a nurturing family! Okay…we have lived the same exact life! When I got married, I didn't even know you had to drain water off of tuna before making tuna salad! LOL! I was angry at my husband for not letting me stock up on oven and microwavable foods and I he said I was such a slob that living with me was like living with a fraternity brother!